Hype and hoopla, contestants and their controversies, Bigg Boss and its big host, need we say more? Season four, 14 inmates, their contrasting backgrounds, and the stage for complete entertainment is set. There's Ashmit Patel whose acting career never took off actually and Seema Parihar, a dacoit who spent 18 years of her life in Chambal ravines! Then there is Abbas Kajmi, a lawyer who represented a foreign terrorist and Rahul Bhatt (son of Bollywood director Mahesh Bhatt), who was accused of sheltering him. Shweta Tewari is another inmate whose ex-husband was also the part of Season 2 and Veena Malik's claim to fame is that she exposed her cricketer beau in the match fixing scandal. Not to forget the sweet and simple Sadhna of Bidaai, Sara Khan and Splitsvilla's winner Sakshi Pradhan who created buzz for the MMS scandal as well! And we have our very own Aanchal Kumar in there as well. Expect for being a bit wary of the heated conversations and controversies that might break inside the house, her sister, Payal Kumar says, Aanchal was game for the show. "She is a famous model, but Bigg Boss will take her to every household in India. Her decision to be a part of the show was very prompt. She knew that the show would give her new ground and more recognition." Some famous, others infamous, the inmates will for sure provide us with a heavy dose of entertainment for the next couple of months. Take it from city-based Joana Magee, who lost the first position to Sakshi Pradhan in Splitsvilla, "All the characters are very interesting. Not everyone might be from the glam world but they have made it to the headlines for some reason or the other. I expect a lot of spice, backbiting and controversies in the next few weeks." Season 4 is looking better of course with due credit to Salman Khan and the interiors of the house. Like Monica Bedi, house inmate of Season 2 puts it, "Salman Khan is a heartthrob. People will watch Bigg Boss at weekends only to see him. TRPs of the show on the weekdays will thus prove people's liking for the show." She is looking forward to how Seema Parihar will adjust with Aanchal Kumar, Hrishant Goswami, Sameer Soni - the big names of the glamour circles. Diana Hayden, who was also seen in Season 2 of the show, had a tough time choosing between Commonwealth Games opening ceremony and Bigg Boss Season 4 launch. "I was switching between the two. As for Bigg Boss, it's going be really interesting with people from stark backgrounds made to live together." Comparing Salman Khan to last season's host Amitabh Bachchan, she says, "He's a rockstar and Amitabh Bachchan is a legend." And about all the members not being from TV, films or fashion world as has been the case in earlier seasons, she says, "As long as one has a story to share, one fits in well in the Bigg Boss house. The conversations would be half interesting if members were all from the usual circle of fashion and TV. Variety always adds spice and this time I am expecting a lot of it." Variety was, of course, added to the show by another unusual contender, Davinder Singh aka Bunty, who was asked to leave the show by the Bigg Boss for his unruly behaviour. But the big question remains - is it justified to cash upon the life story of anti-social elements and is it too much of an experiment? It isn't easy converting a thought into an audiovisual reality…to be put before the audience for either applause or abuse. Much before the project turns into a product, creative differences aren't the only snags. The fact that short filmmakers are short on resources has never been a revelation. Needless to say, with the bare minimum resources come the innovative sources - corporates, sponsors, tie-ups, collaborations, piggie banks, Internet; whatever it takes to keep the liquidity flowing! Bringing you the men behind the lens, who wouldn't give up for anything, for funds…the least. Yogesh Negi, city-based short filmmaker, exhausted his own Rs 40,000 first while going ahead with the Prashanchinh, a project on ragging close to his heart. "It's only after you make a movie, emptying your own account, that later, maybe, some organisation comes forward." He adds, "Almost all the documentarians face a crunch of funds at some point or the other. This, as a genre itself, not being very commercial doesn't attract investments. Despite good concepts, there are no sponsors." The only way out is to explore. On a recent visit to the city, filmmaker Nitin Das, of Filmkaar fame, had confessed to the snags dotting the profession, rather passion. "Don't get into short film making expecting fame, money, commercial gains, success and things like that. Get into it only if you have the heart and passion for it." But for his international project with people from 19 countries, efforts are on to tap resources. "We are looking at the likes of WWF, corporates." From a veteran to a beginner, the common thread that runs through them all is cash constraints. And the source generally depends on the subjects. Adds Yogesh, "Primarily we depend on small-time sponsors. But mostly it works like - if there's a documentary on water conservation, we'll approach the water resource department. We were already planning on a documentary on these lines, but its approximate budget is 70,000." A school of thought that Navalpreet Rangi, 14 documentaries old now, also subscribes to. "For causes like cancer, drugs, there are respective societies that finance the effort. While for others, there's a tie-up with NGOs." He adds, "I make films on my own subjects and themes, mainly biographies of great figures like Kartar Singh Sarabha, Sobha Singh, Shaheed Bhagat Singh, Udham Singh et al. We have a great heritage, but do not know how to handle it." For his very maiden venture Mela Shataar Da, he "Did not face problems because immediately after passing out I'd joined a Punjabi channel that was telecast in UK." The more the financial crunch, the more the competition; the phenomenon, as also the newest ways of tapping the resources, is not restricted to short films, documentaries. Sartaj Singh Pannu, actor, producer, and director didn't hesitate to upload the show reel of his first commercial cinema venture, Soch Lo, on Youtube, to accumulate funds; a film that started with US $400 and ultimately counted up till US $100,000 through the video site. He says, "My friends in US too took upon themselves the task of marketing the film." The philosophy of the survival of the fittest applies like never before. As Yogesh says, "Those who want to go ahead, generally manage to. It's like we get in touch with the like-minded people, pool in resources and just about manage." Imagine if you could personalise your web or have a custom-made browser for yourself, if you had the power to re-design the web by adding exactly the features you want and removing all those annoyances that just get in the way. If you didn’t have to log-in every time you wanted to check for unread emails, or when you saw a funny video you could tweet it to your friends without opening a whole new window or tab! The big question is what if you could do all these things with a zero technical background or degrees in tow? Thanks to certain things, which assist in all this, it is achievable now! Creating the web browser of your dreams is no Herculean task; all it takes is a couple of seconds and a few Google Chrome extensions. The process is simple; nevertheless it requires some bit of understanding. 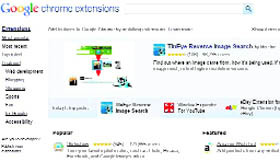 Here is how it is done - an extension is a small programme that can add new features to your web browser, letting you customise your browser to fit your many needs. Chrome has thousands of extensions to choose from, whether you want quick access to your favourite websites or just a way to get notifications when a new email message comes in, you can add as many or as few as you’d like. And installation is fast - just click the ‘install’ button and you’re on your way. “While some extensions are built to directly aid your web experience, others let you be more productive by giving you easy access to the services that you use frequently. With more than 6,000 extensions you can customise Google Chrome with features that you like while keeping your browser free of clutter than you don’t use,” says Rahul Kulkarni, product manager, Google India. Google Chrome has some simple web browsing shortcuts that will help you find whatever you’re looking for quickly, so you can ‘out’ the door and on your way. n Use search shortcuts to find it faster: Once you open Chrome, you can use the top ‘omnibox’ to type in a direct URL or directly enter a search query like [kid-friendly dinner recipes]. Chrome automatically detects which one you want and will take you to that site, or display relevant search results. n Directions are only a click away: Need directions in a pinch? Simply highlight the address, whether it’s in your email or on a website, right-click, and select ‘Search google.com for ___’, and Chrome will automatically pull up a map to that address. n Customise your ‘new tab’ page with favourite sites: The new tab page replaces the blank white page that other browsers show when you open a new tab with thumbnails that link to your most frequented sites or the sites you choose. Get where you're going faster by adding your favorites - from your kids’ school homepage to your personal email, it’s all just a click away. And you can drag and drop thumbnails to reorder them, delete ones you don't want to see or pin ones you want to keep in place. n Keep track of items you want to buy in one place: As you’re online window-shopping, use the Wishpot Chrome extension to save a list of possible purchases in one place. And all your options are saved in one spot so you don’t have to waste time searching again. n Link Chrome to your phone: As you’re heading out of the door, instantly send links from your computer to your phone. Whether it’s a map to your next destination, a recipe for the dinner or a review for the digital camera you want to buy, just install ‘Chrome to Phone’ and enjoy uninterrupted browsing. n Don’t forget to surf in style with personalised Chrome themes: It might not save time, but it’s a quick way to brighten your day - choose from 100 themes from top designers, artistes, celebrities and musicians to make your browser reflect your personal style. Any i-Phone user can now get an easy access to ApnaCircle’s business contacts, as ApnaCircle announces the launch of its iPhone application. The new ApnaCircle application for iPhone gives users an easy access to ApnaCircle’s updates, status, profiles, discussions, connections, inbox, invitations, etc. The application provides users with a quicker response and improvised features; basically a complete mobile experience for professional networking. “ApnaCircle application for iPhone is a step taken to give the smart phone consumers an added tool to network for business and career. As mobiles are the closest and fast growing means of communication, our mobile application gives the power of sharing, connecting and networking in the user’s hand. ” adds Yogesh Bansal, CEO and founder, ApnaCircle.com. “Post the iPhone application, we soon plan to launch our application for Android and Blackberry as well. This is in line with our strategy to reach out to the smart phone users to further boost the scope of professional networking,” he adds. ApnaCircle.com pioneers in the business and career networking space, transforming professionals across the country and globe. As mobiles and smart phones continue to grow as fast modes of communications, the launch of ApnaCircle’s iPhone application will further compliment ApnaCircle’s growing user presence and will widen the platform for professional opportunities. Tripod plays an important role in many photo-shoots; in fact, many creative shots are only possible with its help. Tripod also gives you the freedom to place your digital camera at a 360-degree angle. It is indeed an important accessory for both professional as well as amateur photographers. Tripod is of great help as far as trying out different techniques of photography is concerned, including kite aerial photography, macro photography, night photography etc. It is also used for taking effective panoramic shots. Using a tripod, one can take a shot, rotate the camera with measured steps, and continue shooting consequent shots in order to create panoramic effects. There are different types of tripods, but the most popular design would be the one with the centre post and a mount to hold the camera along with telescoping adjustment to raise or lower the height. Usually the mouth has the plate for placing the camera and offers the freedom to adjust and tilt it in different angles. The camera mount also comes with a handle that helps you operate it by avoiding bumps. It also firmly holds on to the ground with collapsible telescoping legs. Every tripod has a head, which is the basic that enables the camera to tilt sideways for taking professional portraits instead of landscape photography. Small, low cost table tripods are also available and these can be conveniently carried along. In addition, some photographers like to use a single, long leg tripod called a monopod. It provides equal image stabilisation by supporting the photographer, who does not need to bear the full weight of the camera. More expensive tripods have the option of tripod-head combination and can be customised according to need. Sometimes such tripods are also equipped with additional features such as reversible centre post, which helps you mount the camera between telescoping legs. This helps in taking lower shots with different angles. Now, even though you place the camera on a tripod, tiny vibration will occur when you press the click button, which is why advanced digital SLR comes with mechanical image stabiliser. Mechanical image stabilizer will detect the tiny vibration created by your hands and compensate it by fractionally moving the sensor inside the camera. In most common compact digital camera, mechanical stabilisation will offer two or three exposure shot, the other methods to avoid blur image is by setting higher shutter speed so that the vibration does not have time to shake the picture. In this case, the camera automatically sets itself to higher light sensitivity to compensate for less light and adds more information to the sensor in less time. Microsoft Corporation India Pvt Ltd announces the availability of Internet Explorer 9 (IE9) Beta for its consumers in India. Enabling a more interesting Web, Microsoft has re-imagined the role of the browser with Windows and Internet Explorer 9 to deliver an experience that makes the Web feel as native as consumers’ favourite PC applications. Using full capabilities of Windows and hardware, IE9 enables a version of the Web that is faster, cleaner and more trusted by default. In short, IE9 is helping the Web go native and unlocking its beauty. Consumers can download the beta at www.beautyoftheweb.com. Keeping in mind the changing consumer needs, the new browser has been made for customers who love rich Web applications and developers who love to build them. These experiences will be available to consumers in the coming weeks. Globally, Microsoft has partnered with over 70 top websites and global brands who have created new experiences to show off the capabilities of Internet Explorer 9 and whose collective reach is over 800 million visitors or about two-third of the active people on the Web. These partners include Amazon, eBay, IMDB, Facebook, LinkedIn and Twitter. Samsung electronics enhance its dual Sim offering in the Indian market by announcing the launch of three new Dual Sim handsets which include Samsung Star Duos , the industry’s first ever 3G and 2G touch Dual-Sim Active phone Guru Dual 25 (GT-E1225) and Guru Dual 26 (GT-E1252). The new Samsung Star Duos is the industry’s first 3G + 2G dual-standby touch phone, best suited for consumers who prefer full – touch functionality in their phones. The 3G plus 2G Dual standby expands communication networks by utilizing two SIM cards to expertly manage both work and life tasks in one unit, and allows switching between both without re - powering the handset. The WAP/MMS/E-mail supported software keeps the user always connected. According to Ranjit Yadav, director, Mobile & IT, Samsung Electronics, "The Dual-Sim market continues to be a strong focus area for us. We’re looking at enhancing our presence in this segment through Innovation and excellence. The new product line up is an example of the same. Samsung’s Dual – Sim offerings range from Duos, Dual – Sim Active Touch, standby and Dual – Sim shift advantage thereby giving consumers a wider choice in economical operator tariff plans and product benefits." The touch functionality helps in instant messaging, easy access to mobile applications and business related features. While dedicated widgets seamlessly manage switching between 2 SIM cards, the 3 page extended menu and touchwiz 2.0 plus provides intuitive UI for easy navigation. The Samsung B-7722 has distinct Business Features and tools to maintain a mobile office: Active Sync, which updates e-mails from the desktop to the user’s mobile, phone book 2000 for organizing contacts, Document viewer handles MS Office, PDF TXT and other files, multi –language dictionary and an offline mode which allows the user to turn off his/her phone while he or she continues to work on other functions. Actor Emraan Hashmi says that he likes playing characters with grey shades as they are close to reality. "I have always played characters with grey shades and I like it. I like that certain realism in the character. I suspect people who say they have done only good things in life. I am normal and I have done bad things, I have made mistakes," Emraan said. "Everyone has the same wants. Some people say they don't feel jealous or greedy...(but) I feel all these emotions. I am comfortable with people who say they have done bad, wrong or unethical things and don't hide it. It is redeemable. I like playing such characters," the 31-year-old actor said. "Most of my characters have dark tones and are anti-establishment. They rebel. They have similar traits," he added. Emraan, who has played negative roles in films like Murder, Gangster, Once Upon A Time In Mumbai among others, will be at it again in his upcoming film Crook. Crook, is directed by Mohit Suri of Kalyug fame and has debutant Neha Sharma playing the female lead. Talking about her Crook co-star, Neha said that the actor was different than what his on-screen image suggested. "Emraan is a much-disciplined person and has no tantrums. I know that he does the kissing scenes for films and it works as a USP for him. His screen image is not important to me. He is not like that in real life," she said. India's Got Talent winners Shillong Chamber Choir say that the victory has introduced them to popular Hindi music and they are now looking forward to revive Bollywood classics in their own way. "This competition has taught us to be more flexible and exposed us to the Bollywood kind of music. We would love to explore this genre further and revive old songs like Yeh Dosti and Yaadon Ki Baraat," Neil Nongkynrih, founder of the choir, said. The musical group, which won over audiences after adapting Bollywood songs to their own style while performing at the talent hunt on Colors, are open to signing film projects provided they are not asked to compromise on their kind of music. "I am very open to doing films, not because of their financial appeal but because it can be an interesting genre to explore, see how our music can be adapted in Bollywood. We would also like to perform on television and live shows," said Neil. The choir, who sing mostly Western classicals, lifted the trophy on Saturday at the gala finale of the talent contest judged by Sonali Bendre, Kirron Kher and Sajid Khan. "Our victory is historic, in the sense that this is the first time a musical group from Meghalaya has won such a talent show. It will definitely boost talent from the North East," said Neil. After working in issue-based films like Lamhaa and Aakrosh, actress Bipasha Basu is now voicing concerns about piracy that is plaguing the film industry. The actress, who is gearing up for the release of her new film Aakrosh about honour killing, urges people to stop buying pirated CDs and DVDs. "Lot of hard work goes into making films. Each film supports hundreds of people (Entire Crew and their families). Say no to piracy, watch films in theatres," she wrote on her Twitter page. Punjabi singer Mika Singh recently got a chance to shake a leg with his idol, the legendary Gurdas Maan, on the hit track Apni to jaise taise from Housefull. He says that for him it's like a dream come true. "Gurdas Maan is a rock star and all the Punjabi guys of my age aspired to be like him. It was an amazing experience to meet him when he had come for Daler paaji's (Daler Mehndi) show so many years ago. Bollywood star Akshay Kumar has taken time from his busy schedule to jet off to Dubai for a quick vacation with wife Twinkle Khanna and son Aarav. Veteran actor Aruna Irani is making a comeback in Marathi movies after 16 years. The movie, Bol Baby Bol, directed by Vinay Laad and produced by her brother Balraj Irani, would be released by early next year. Laad was all praise for Aruna Irani. "It is a family comedy revolving around a toddler and Arunaji plays a pivotal role in the movie," he said. It was great working with her as she is a dedicated artist, he said. "We completed the entire shoot in 22 days," he said. On whether she faced any language problem, the filmmaker, who has made serials like Astitva for Zee Marathi, said she got the dialogues recorded scene-wise on a CD. "She enquired about the scene to be shot next day and came prepared by listening to the recorded dialogues. There was no problem," he said. The movie cast includes Makrand Anaspure, Anikesh Vishwarao and Neha Pendse. The last time Aruna Irani acted in Marathi movies was in films like 'Changu Mangu'. Besides Bol baby Bol, Laad also has Chi Sou Kaan Mary Fernandez and Kay Karu an Kasa Karu lined up for release.